When you work in property management, you need to be certain the building you operate always looks its best. Getting a power washing every so often is a great way to ensure your business attracts customers or new tenants. However, a routine pressure washing is also good for making sure your property remains safe and reduces your liability in any slip and fall cases. Oil, mold and other substances can build up on pavement over time. People will be walking across your parking lot or sidewalk in order to get to the building, and if they slip on something that should have been removed a long time ago, then they could file a lawsuit against you. To reduce the likelihood of someone falling, you should pressure wash pavement at least once a year or whenever significant residue has built up. Over time, the materials making up your building start to slowly wear away. Entryways can begin to crumble ever so slowly, siding and other exterior materials can start to break away, and entry points for insects become especially troublesome. Dirt and debris only accelerate this process, so the first step in prolonging the life and structure of your building is to keep it clean! Cleaning a parking lot takes some time. If you attempt to do it yourself, you are taking time out of your schedule to do this, and you are losing money. Additionally, being unskilled will require you to spend more time cleaning, and that parking lot will need to be closed off for longer. By hiring a professional service to do this job, your parking lot will be shut down for less time, and you can be certain every inch will be taken care of. Overall, you want a company policy that emphasizes cleanliness. This involves sweeping the floor regularly, and having “Wet Floor” signs on hand in case a spill develops. These are basic tasks you can do on your own and will really go a long way in promoting a safe, clean atmosphere. Pressure washing will keep your commercial property looking great. 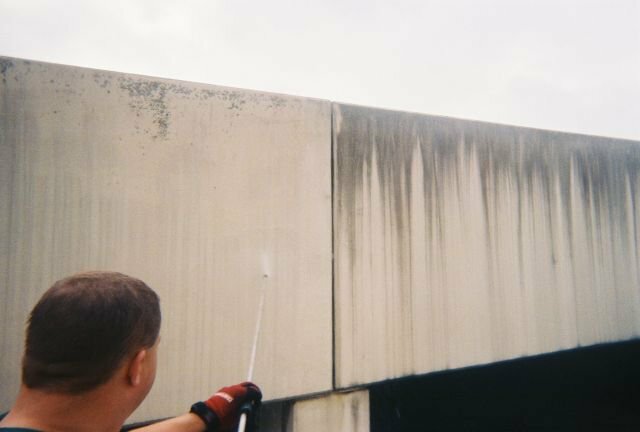 Effective power washing is offered by the professionals at Sun Brite Services, who have worked with numerous property management owners across Atlanta. To get in touch, contact us at (678) 498-7660. As stressful as budget season can be for property managers, it is the best opportunity to set your location up for success in the following year. Taking the time to consider all aspects of your property’s needs will alleviate stress in the months ahead. “What’s one way to ensure you have a rough year as a property manager? Have a budget that doesn’t reflect what the property needs.” -Erin McTear, Assistant Property Manager, Mid-America Real Estate-Michigan, Inc.
1. Start with a running list of the things your property needs and the things your property could benefit from having. While it’s not practical to afford your entire wish list, having everything in front of you will help you see which “wants” you can budget in after “needs” have been accounted for. What sets your property apart and creates long-term tenants? Don’t let maintenance go by the wayside. An aging property can still look fresh with the right upkeep. Tenants, and especially prospective tenants, seek spaces that are clean and modern. 2. Next, consider the best contractors for the job. Is your landscaper constantly underperforming? Does your roofing contractor guarantee repair work? Is each vendor performing and sticking to their numbers? Budget season is the right time to consider bids from new contractors. Your relationship with your contractors should be a partnership. Consider: Who are the Major Players in Your Budgeting Process? Involve as many people as you find helpful. An all-encompassing budgeting team comprises owners, asset managers and outside partners, plus professionals representing property management, leasing, accounting, design, construction and marketing. 3. Lastly, you can never check your budget too many times. Don’t miss important services such as irrigation, snow removal and pressure washing. Consider: What services help my property thrive? Don’t consider these services a luxury. An inviting property can mean the difference between loyal customers and people that become accustomed to just driving right past. Leaving these out may be the biggest mistake you make for your budget! Sun Brite’s pressure washing expertise can make your property shine. We have over 25 years of experience in the Greater Atlanta community! If we can provide a quote for your upcoming budget, please give us a call at (678) 498-7660.